I typically make baked goods I love to eat, but this past Father's Day was an exception. 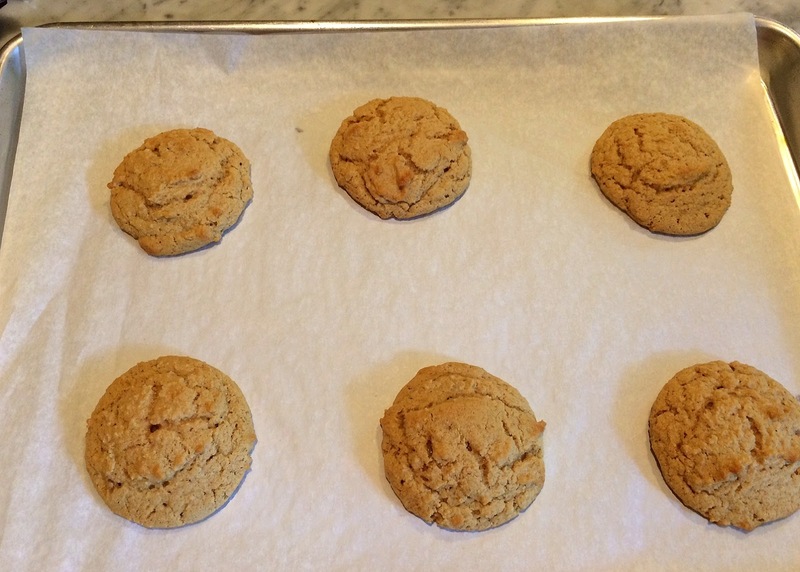 I hate am not a fan of peanut butter cookies, but I wanted to do something special for the DH so I tackled these peanut butter cookies. They received a big thumbs up from those who like this sort of thing. 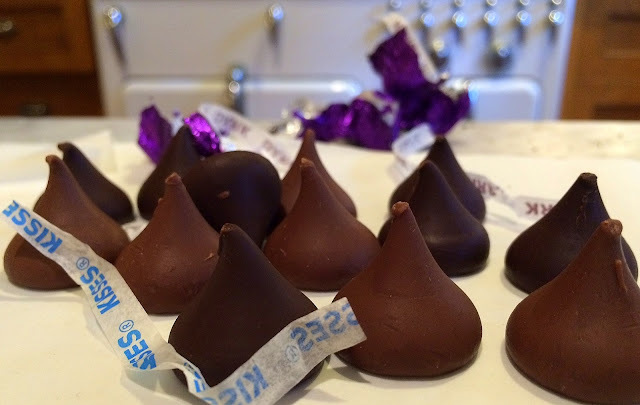 To begin, unwrap a lot of Hershey's Kisses. I got both the traditional milk chocolate ones, and the newer dark chocolate kisses for a little variety. Beat the butter, add the sugars and the eggs. Combine well. The dough is very sticky, so I used my ice-cream scoop to portion out the batter. The first baking is about eight to 10 minutes. 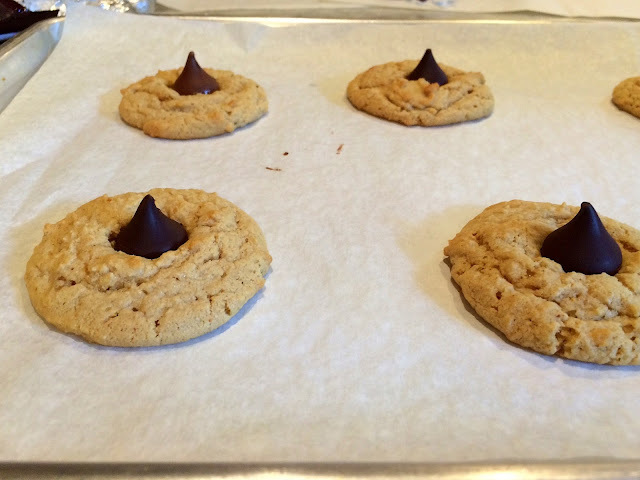 Remove the sheets from the oven and place a Hershey's kiss atop each cookie. Return to the oven for about two minutes. Cool on racks and enjoy! 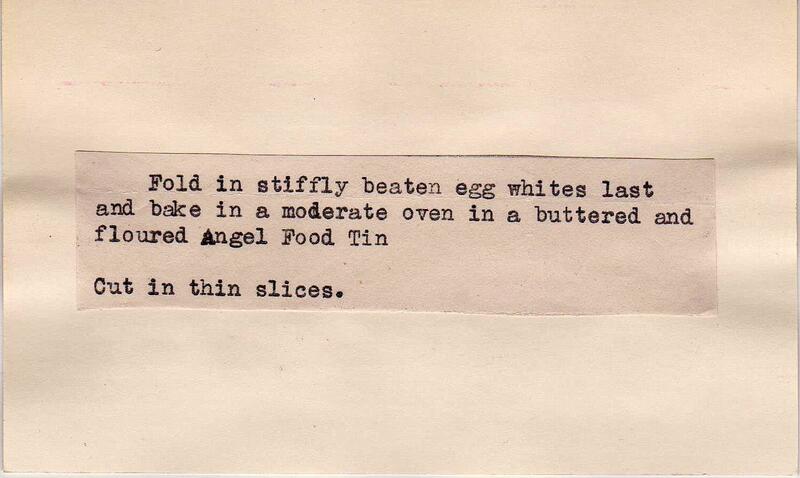 The vintage recipe card is rather unclear, so I've written the method I used below. 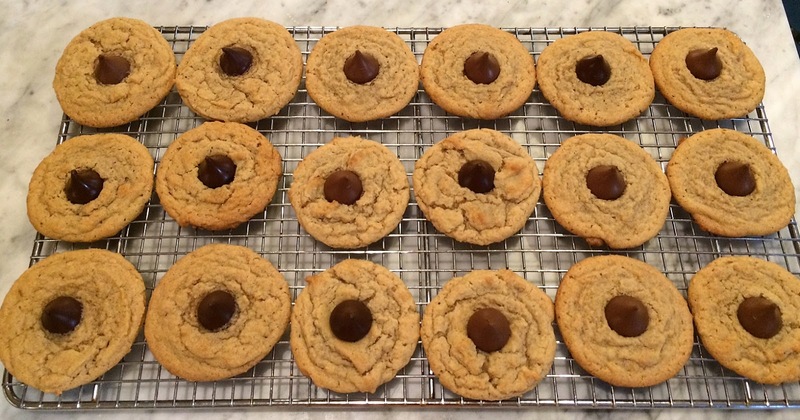 I made the cookies larger than called for ("small balls") so if you like a better chocolate-to-cookie ratio, you can simply make them smaller. 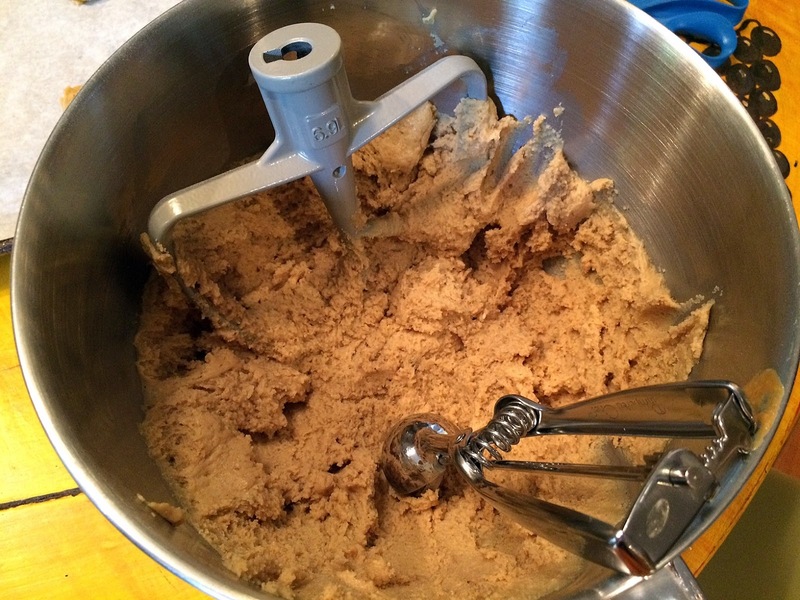 I would refrigerate the dough for about an hour if you have to handle it (i.e., don't use an ice cream scoop) as it is rather sticky. Line several baking sheets with parchment or foil. Unwrap the Hershey's Kisses -- the amount depends on how large your cookies are. Combine flour, baking soda, and salt in a small bowl and set aside. Beat the butter, add the sugars and beat well. Add the eggs, milk and vanilla and combine. 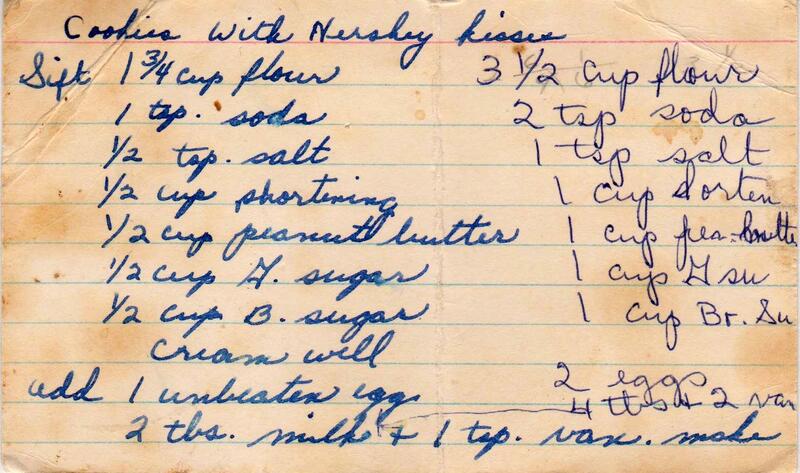 Add the dry ingredients and combine. Form into balls -- the size of your choice. 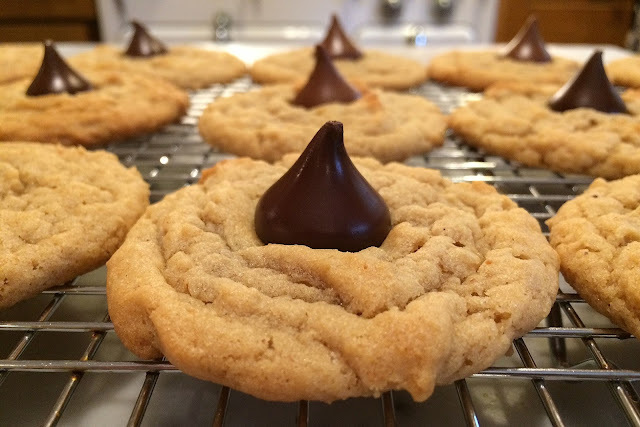 Remove from oven and place one Kiss on each cookie. Return to oven for about two minutes. 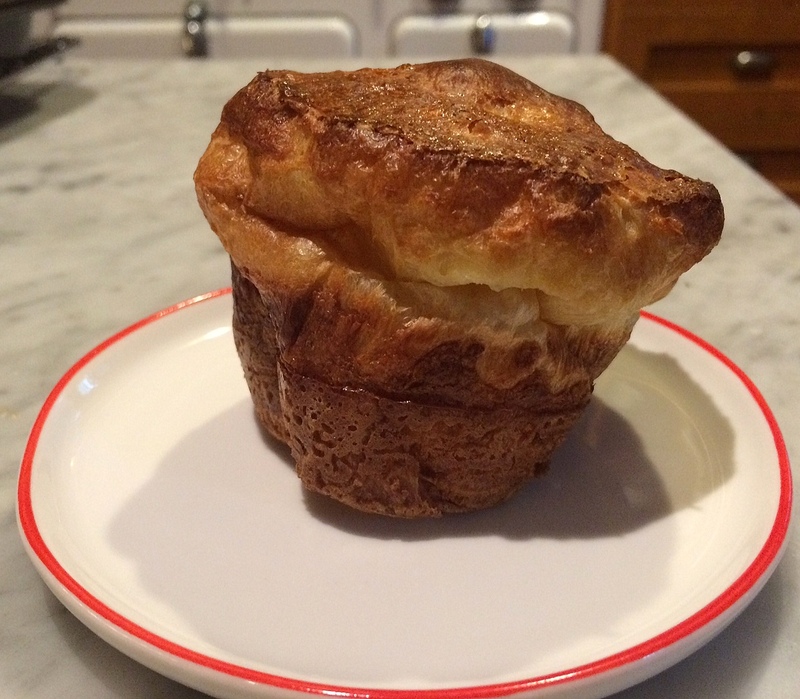 If you have flour, salt, milk and eggs, you can make popovers -- a perfect Father's Day breakfast treat -- in minutes. And with this recipe, you don't even need to preheat the pan or the oven (which, if you bake, is quite revolutionary, for one is instructed to always preheat for popover success). 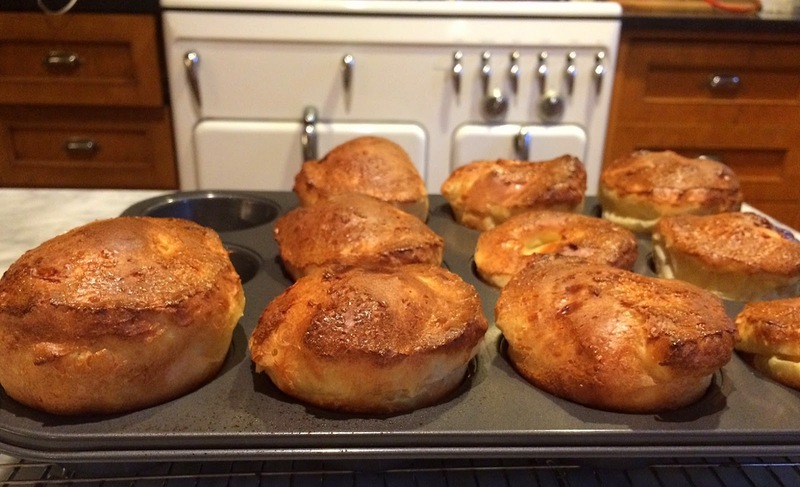 Popovers -- basically just hollow rolls -- are an Americanized version of Yorkshire pudding, and get their name from the fact that they pop over the top of the tin. 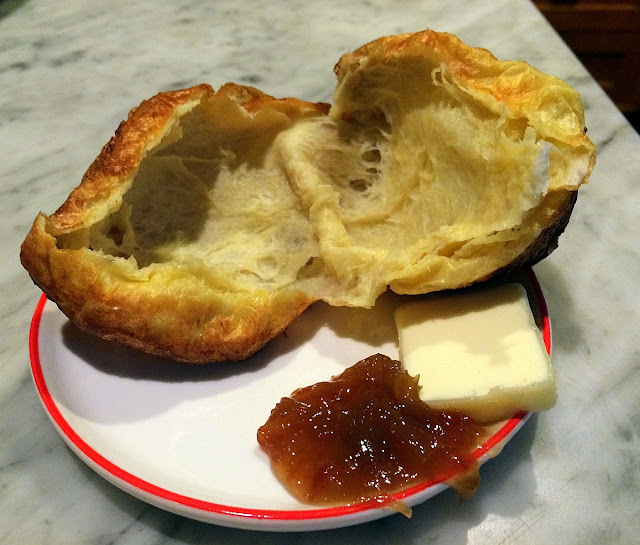 I made these once before, using a dedicated popover pan which you can see here. 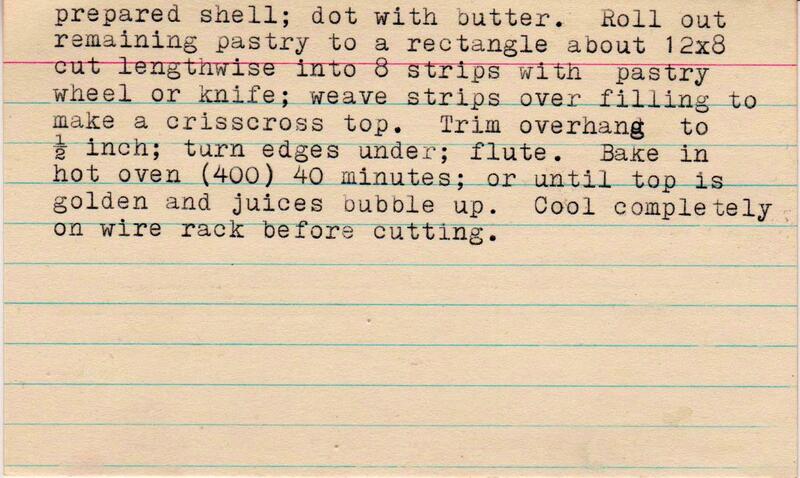 This new old recipe -- from the collection of a Texas estate -- is even easier and doesn't require any special equipment. 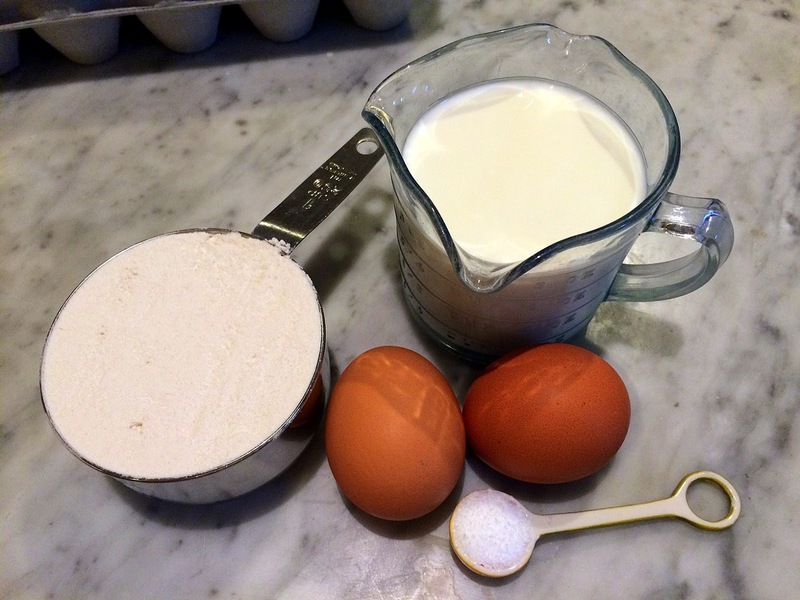 These couldn't be simpler to make -- the batter is mixed in a bowl with a spoon, definitely low-tech. And they are absolutely delicious, especially served with a pat of butter and jam on the side. Below is the mis en place -- all the ingredients you need. Just break the eggs into the bowl and add the rest of the ingredients. Fill the well-greased (don't skip this step!) 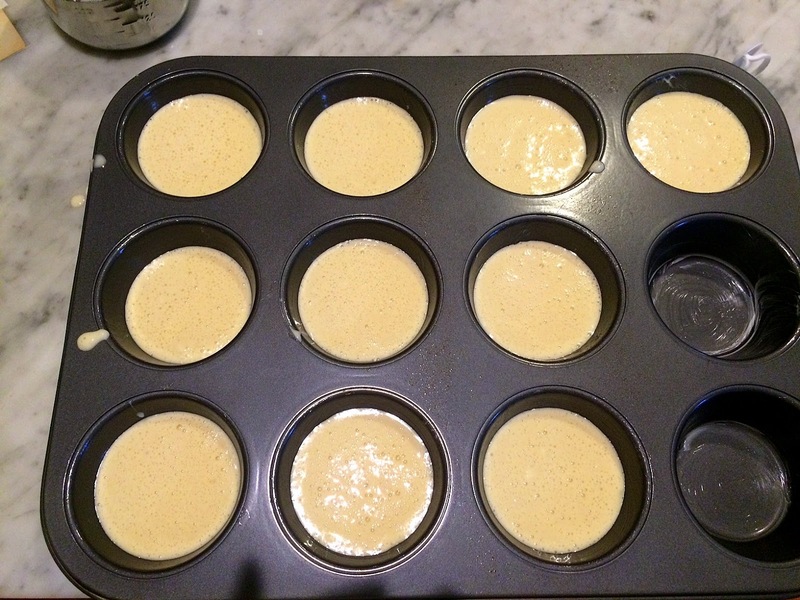 muffin tins about 3/4 full. Do not peek while baking. Production notes: I followed this exactly. Because I only had skim milk, I used about 1/2 cup of skim milk and 1/2 cup of half and half. 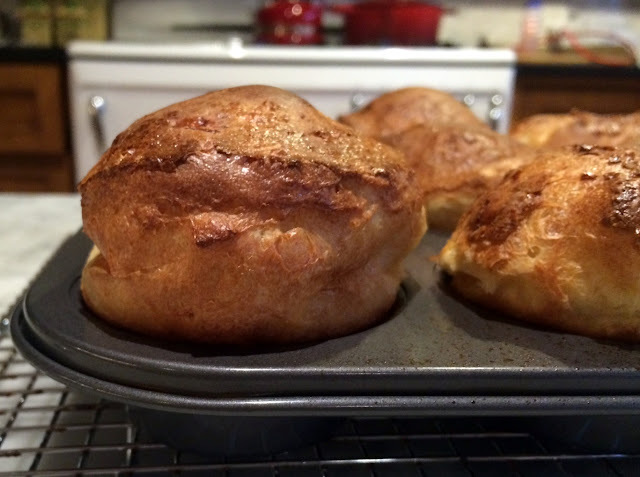 I had a bit of trouble releasing the popovers from the tins, so be sure to grease them very well. 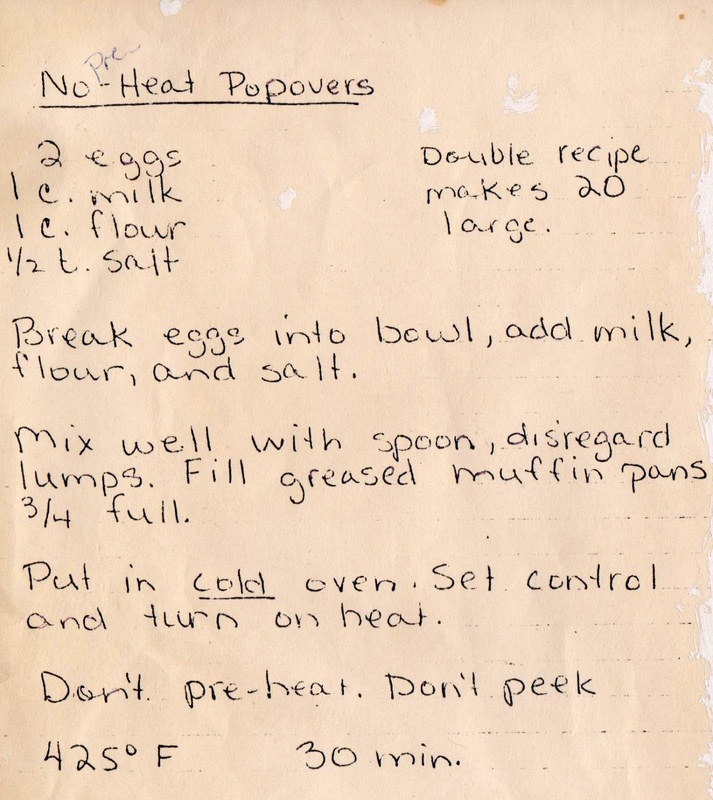 A reader from Canada sent me this c. 1970 recipe, not from a handwritten recipe card, but annotated by her mother and a family favorite nonetheless. Caroline wrote: My mom and dad are in their late 80s now, and mom doesn't bake much anymore, but I remember when my sisters and I were young, she'd have chocolate chip cookies coming out of the oven as we were walking up the driveway coming home from school. Ahhhh, now that and a glass of cold milk was bliss to a little kid! I doubt taste memory gets any better than that. 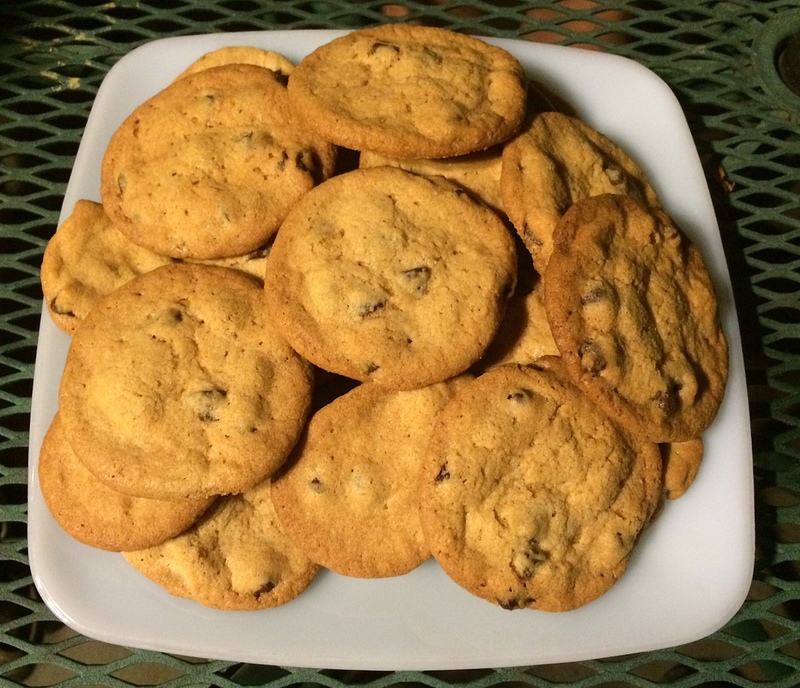 And the nice thing about these cookies is that they are both crispy and chewy, so the texture satisfies all. 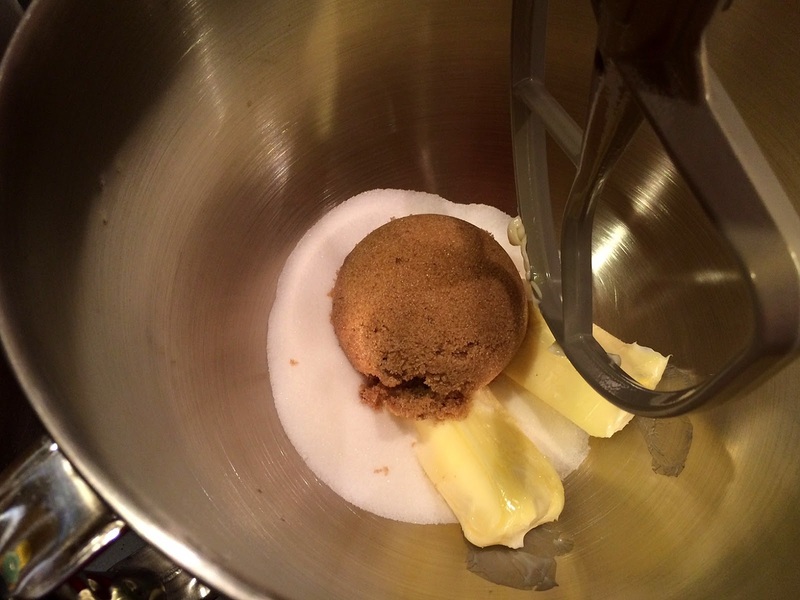 Start by blending the butter and sugars. Add the egg, followed by the dry ingredients. 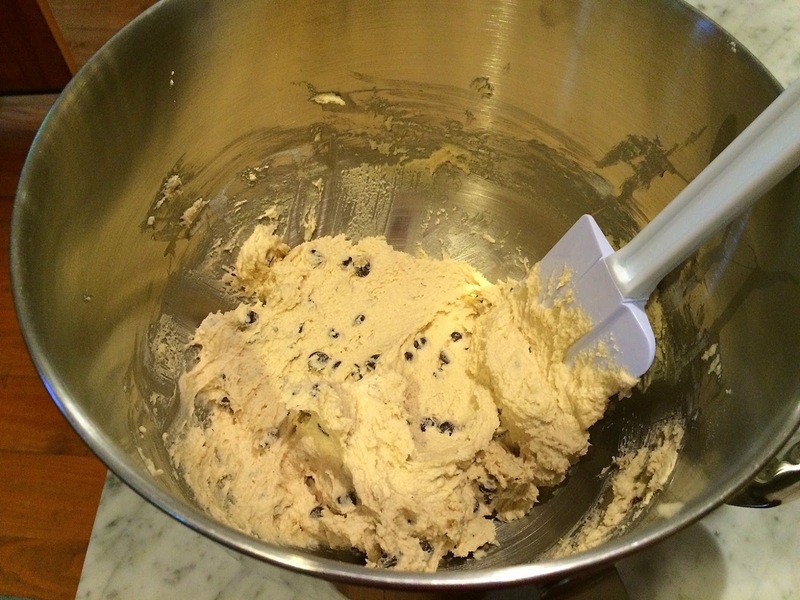 It's best to blend the chocolate chips in by hand, i.e., not in the stand mixer. I always use a small ice cream scoop to portion out the dough, because it's quicker, easier and less messy, but a regular spoon works fine too. Bake, cool (if you can wait) and enjoy. 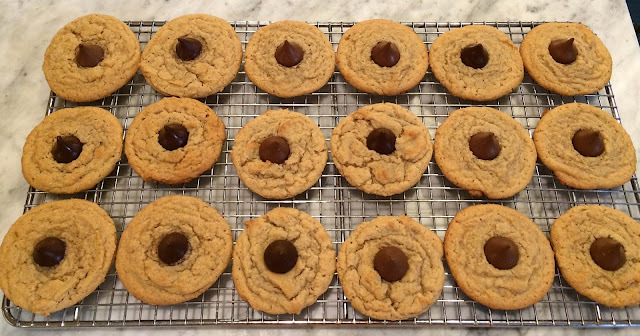 One suggestion: Add more chocolate chips, maybe double the amount listed! Mrs. Tilden did. 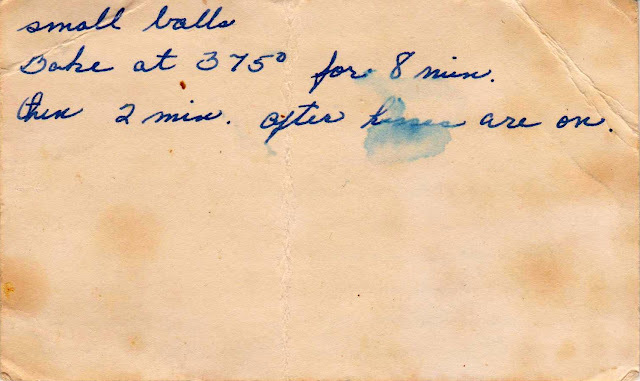 I followed Mrs. Tilden's notes, using all-purpose flour and setting the oven temperature at 350 instead of 375. 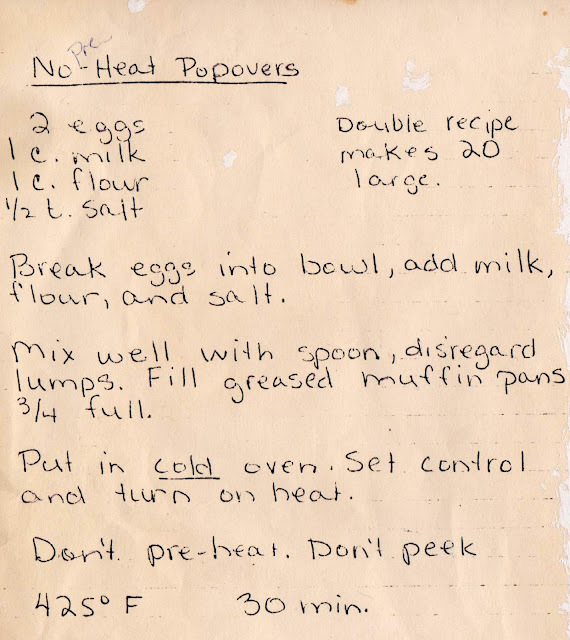 Below is Mrs. Tilden's cookbook that contains the recipe. 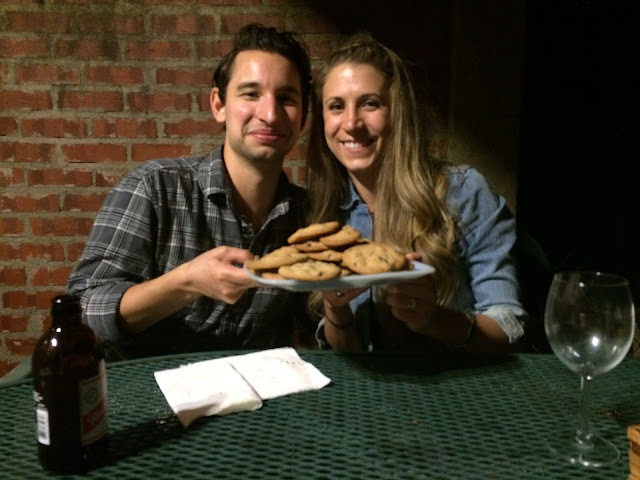 Peter and his girlfriend Alyssa with a plate of cold cookies. The temperature didn't prevent them from eating many and departing with a doggy bag of cookies. When I saw that this c. 1950 recipe combined two of my very favorite things -- cake and whiskey -- I just had to give it a try. Brandy Cake (whiskey can be substituted, according to Wilma Eckert, the recipe's author) is a yellow cake flavored both by liquor and lemon. 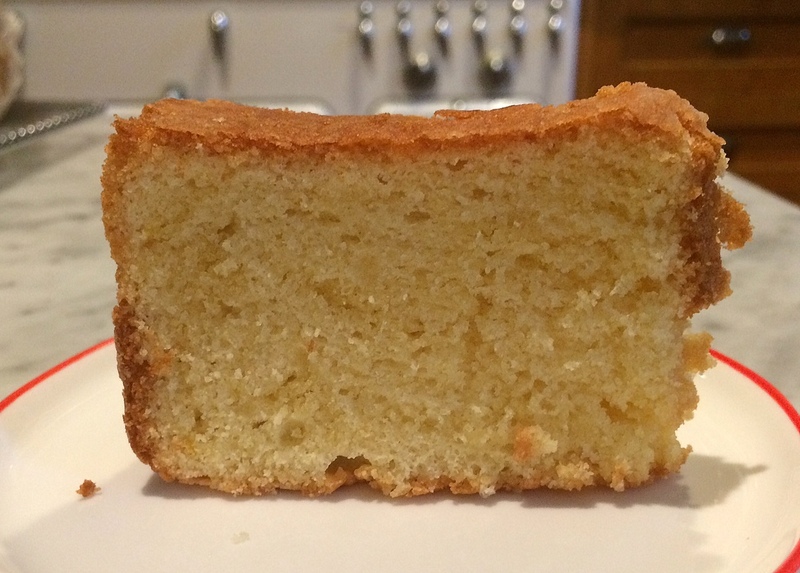 It has a delicate crumb and delicious flavor. It's pretty easy to make, though it requires separating the eggs, beating the whites and folding them in, a step I find somewhat taxing, though it does lighten the texture. 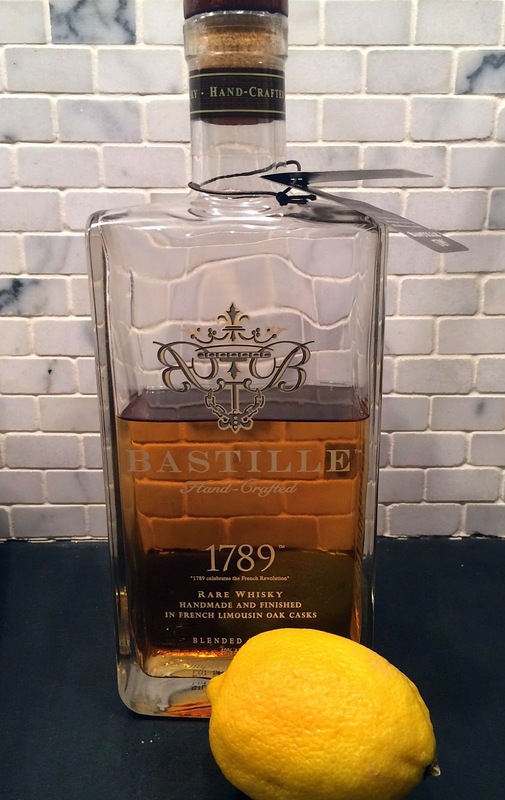 I used a new (for me) whiskey from France called Bastille. While my very favorite scotch is Lagavulin, it has a peaty flavor, and probably not a good choice for cake. 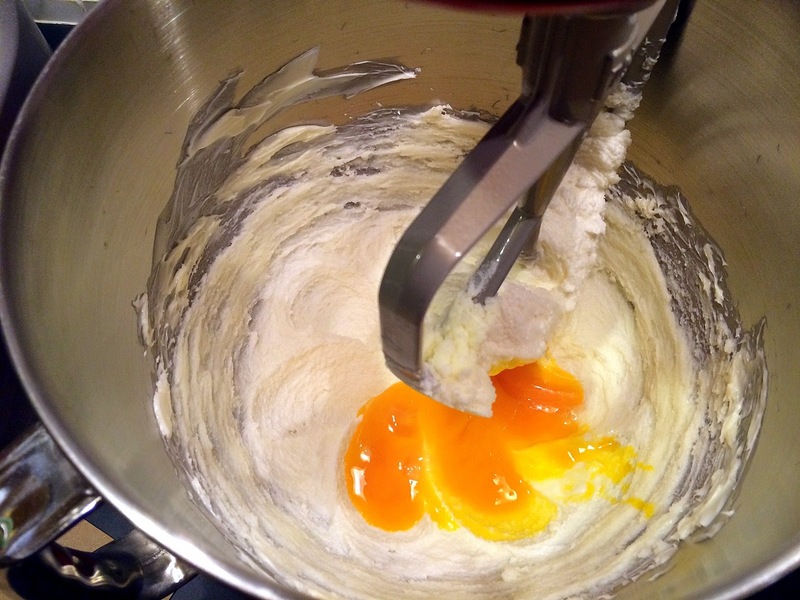 In the bowl of a stand mixer, beat the butter and sugar, and add in the egg yolks. After the lemon zest and juice are incorporated, alternately add the whiskey and dry ingredients. Mix until combined. 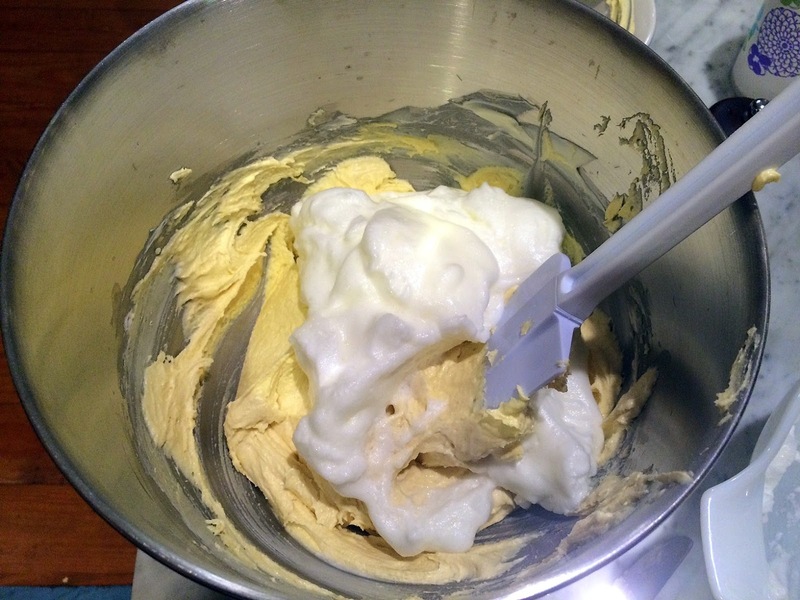 Carefully fold in the egg whites (which you've whipped to stiff peaks in a another bowl). I always add a bit of cream of tartar to prevent overwhipping (which makes them dry), and I always use a very clean bowl and beaters, because any fat or grease will impede their whipping. Spoon the batter into a greased and floured angel food cake pan. Smooth out the top. Bake for about 45 minutes. I got overly involved in a book I was reading and overbaked the cake by about five minutes -- notice how it's coming away from the sides of the pan a bit too much? Release from the pan and let cool completely. 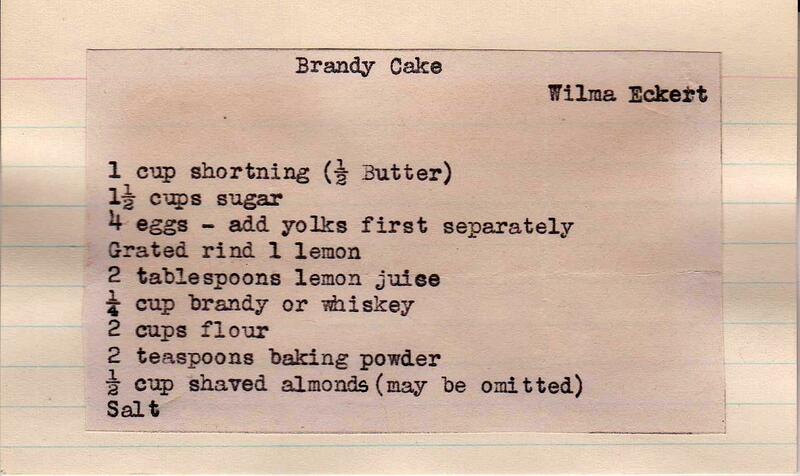 Production notes: I followed this exactly, except used all butter for the shortening, used whiskey instead of brandy, and did not add the optional almonds. I added a scant teaspoon of salt (the amount isn't indicated in the recipe), and if there's a next time, will add a bit more lemon zest (grated lemon rind). I baked it (actually overbaked it) for 50 minutes. Should have pulled it from the oven five minutes earlier. 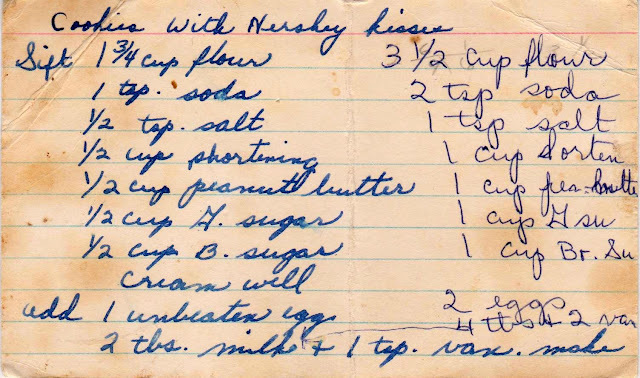 Easy-to-follow recipe below the card. 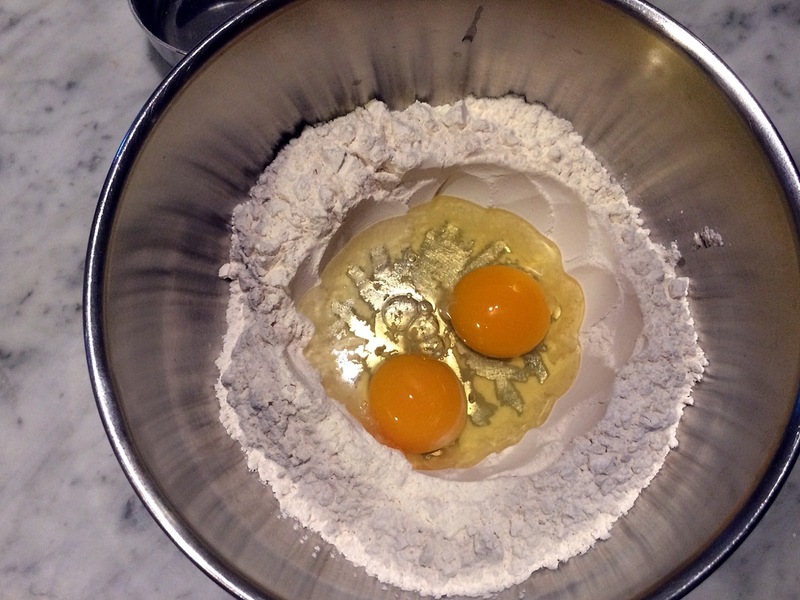 Separate eggs, placing the whites in a medium to large bowl. Beat butter until smooth. Add sugar and beat until well combined. Add egg yolks and combine. Add lemon zest and lemon juice. Add 1/2 flour mixture and combine. Add whiskey. 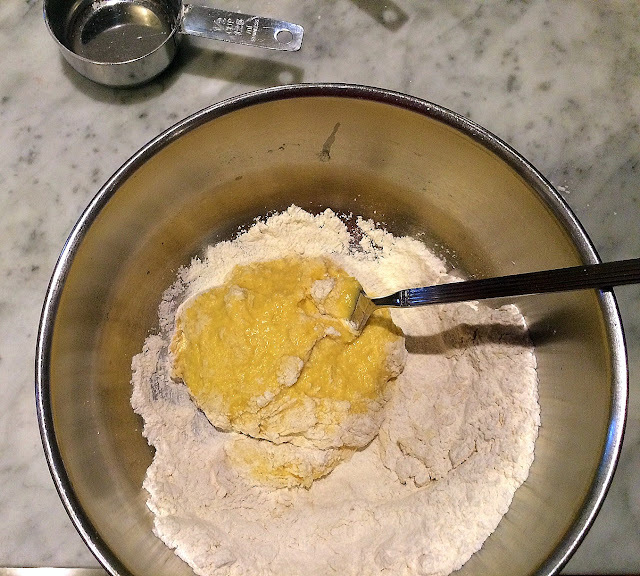 Mix and add the remaining flour mixture. 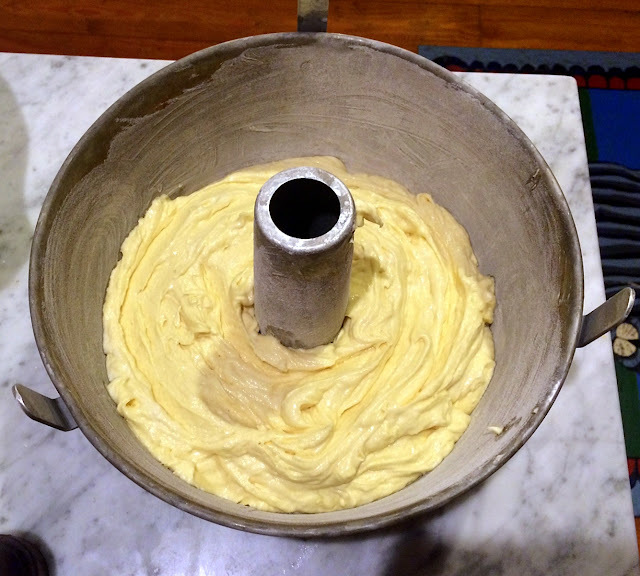 Whip egg whites until stiff peaks form. Using a spatula, fold egg whites into batter until combined. 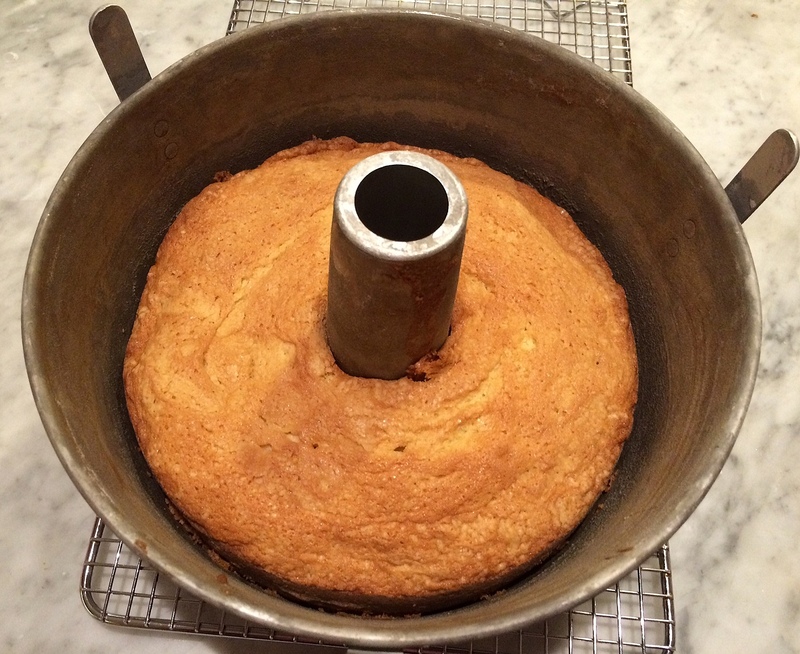 Spoon batter into prepared cake pan. Smooth the top. 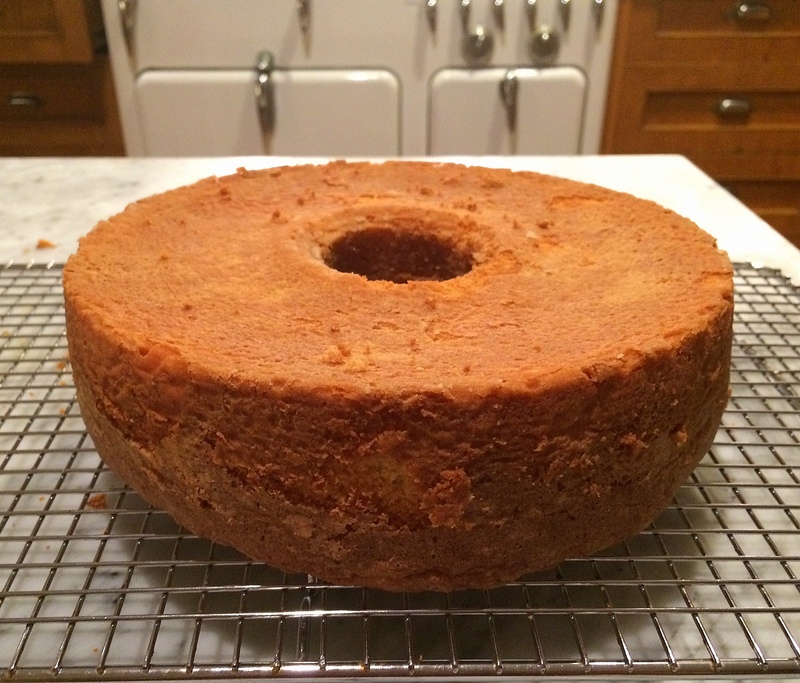 Remove from oven, cool for about 10 minutes, then turn cake out on a baking rack to cool. 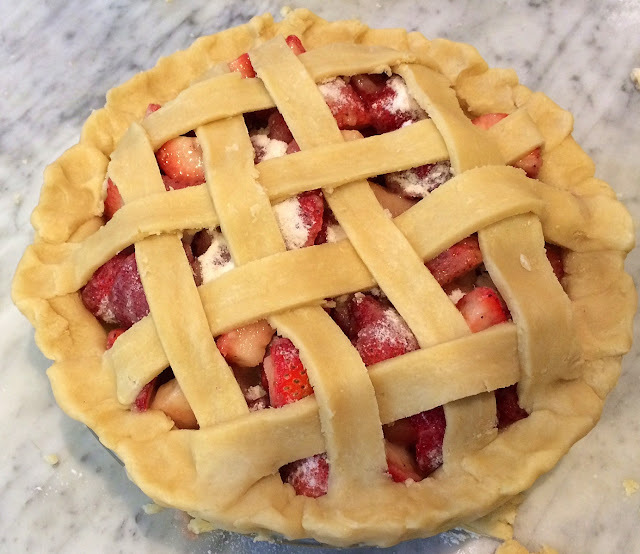 There are two kinds of strawberry pies: the type where the strawberries are placed uncooked (or just barely cooked) into a baked pie crust (here's one example), and the type I made here, where the strawberries are baked along with the crust.This latter pie is best for strawberries that aren't at their peak (or, if like me, you find yourself with a a lot of supermarket strawberries that look beautiful but lack the flavor of farmer's market strawberries). Begin by hulling the strawberries. There's actually a kitchen tool for just this purpose, but eschewing single-use kitchen items, I don't have one, so I just sliced off the tops. 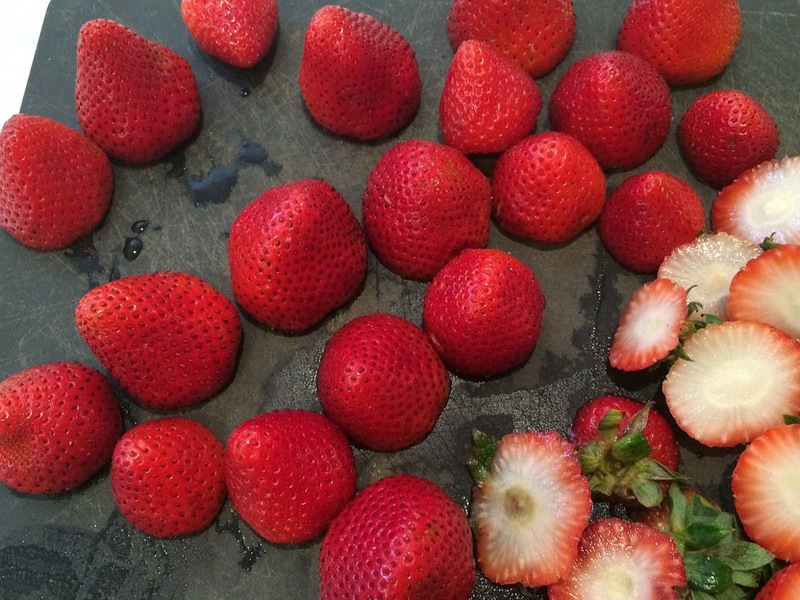 If the strawberries are large, either halve or quarter them. If small, you can leave them whole. 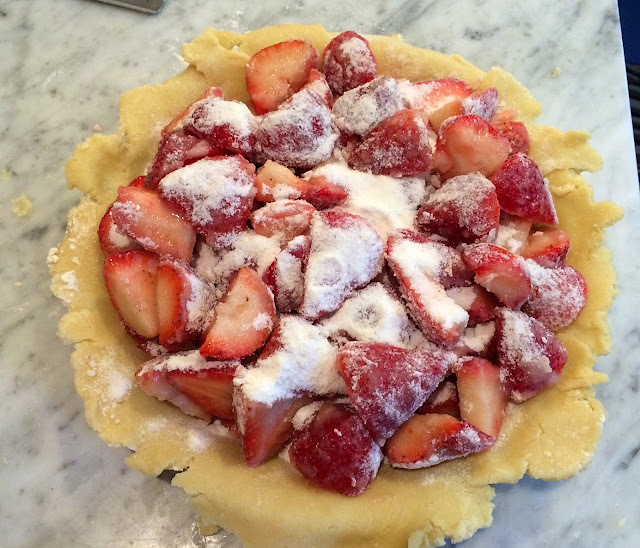 Below are the sliced berries and the other filling ingredients -- flour, sugar and nutmeg -- assembled and ready to go. 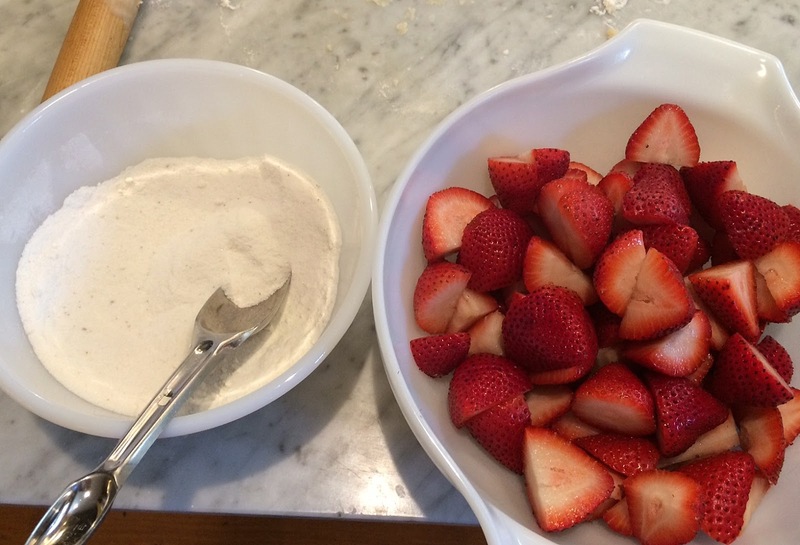 Combine the berries and the flour mixture in a bowl, and carefully coat the berries. 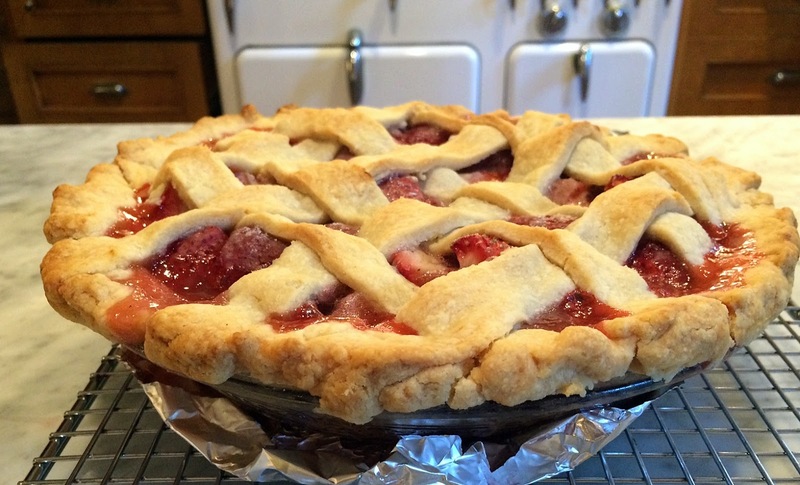 Make your favorite double pie crust. 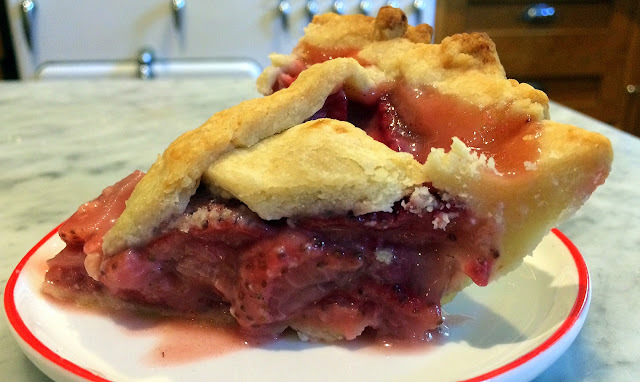 Line a pie pan with the bottom crust and pour the filling in. 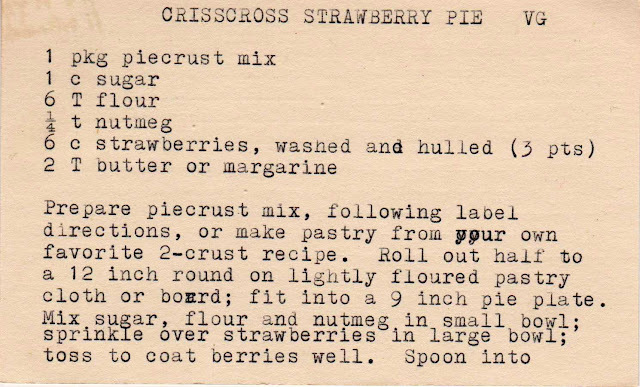 Roll out the top crust, and cut long strips for the crisscross top. Weave the top pieces together, in an over-under method. I realized too late that I neglected to photograph this step. Place the pie on a large hotel pan or cookie sheet, which you've lined with parchment or aluminum foil -- the filling will bubble over. 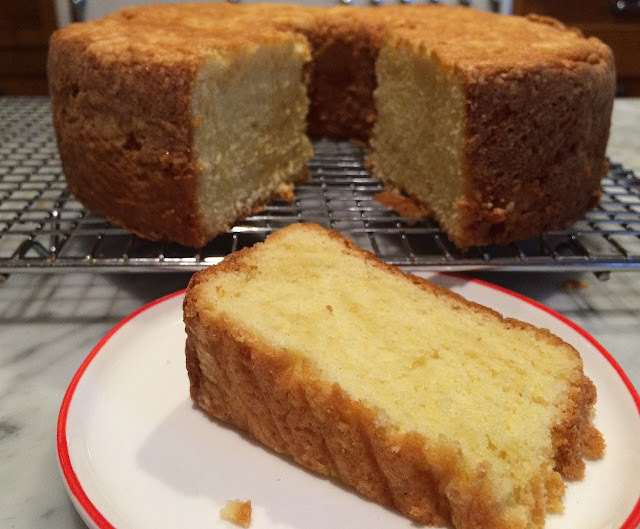 Bake, cool, slice and enjoy! 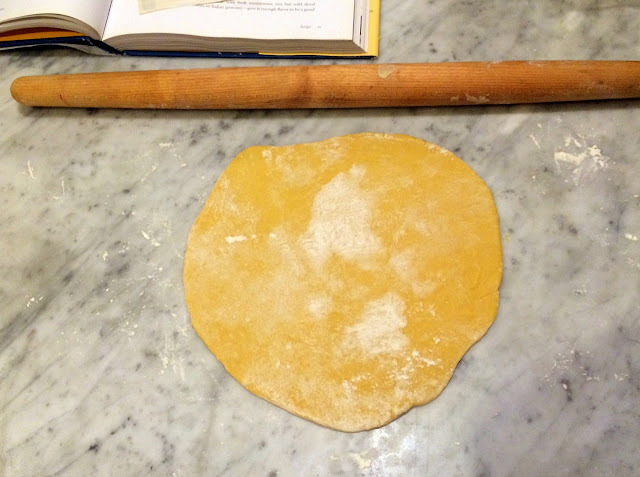 Production notes: I used a homemade pie crust (recipe posted below) and an 8-inch glass pie plate. I also forgot to dot with butter - it was delicious nonetheless. 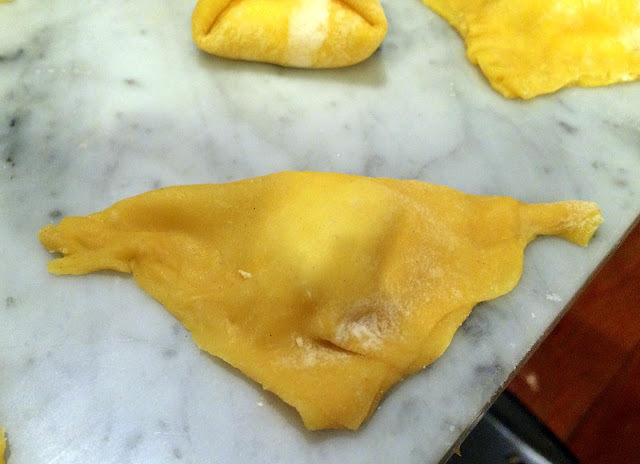 A few months ago, I agreed to demonstrate kreplach making at the Museum at Eldridge Street's annual Egg Rolls, Egg Creams and Empanada Festival, which takes place next Sunday to celebrate the Lower East Side's delicious cultural diversity. 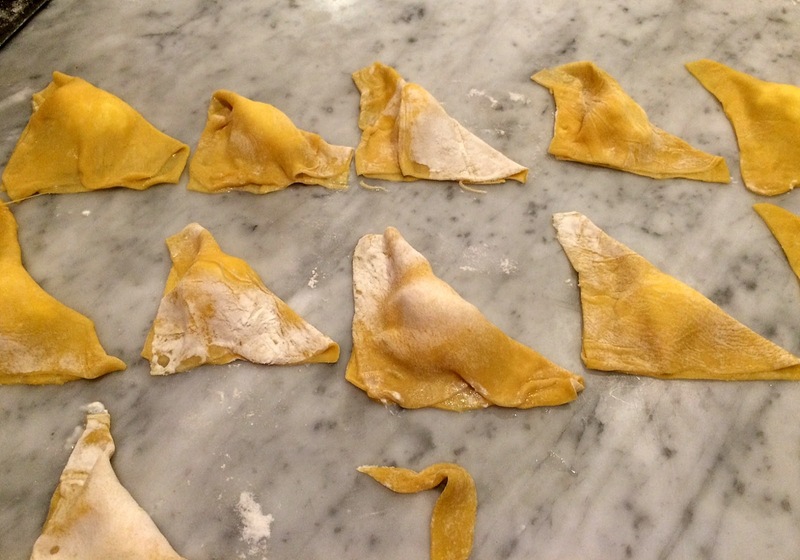 Having never made kreplach before, I thought I'd better practice at least once. (This reminds me of the joke about how medical residents learn new procedures: see one, do one, teach one.) 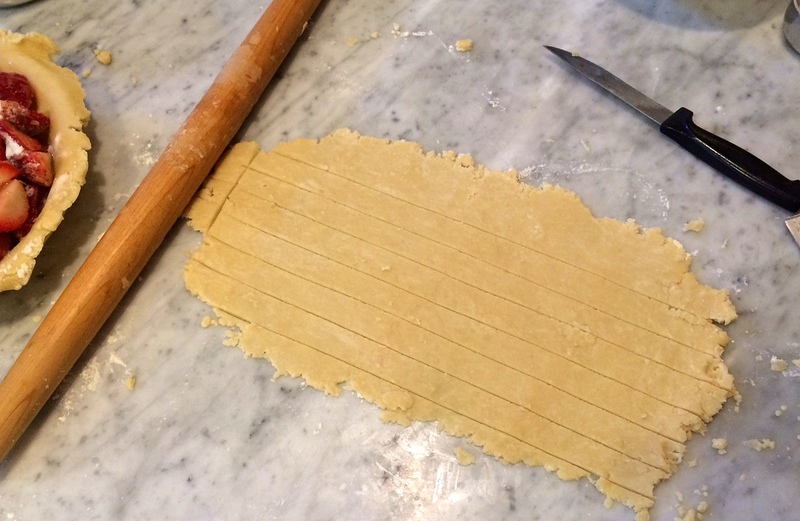 But having made about a dozen apple strudels, which require -- as kreplach do -- rolling the dough nearly paper thin, I felt up to the challenge, even though I've never seen a kreplach being made. Kreplach are often described as Jewish ravioli or tortellini. They are egg noodle dumplings filled with either a meat or dairy filling. 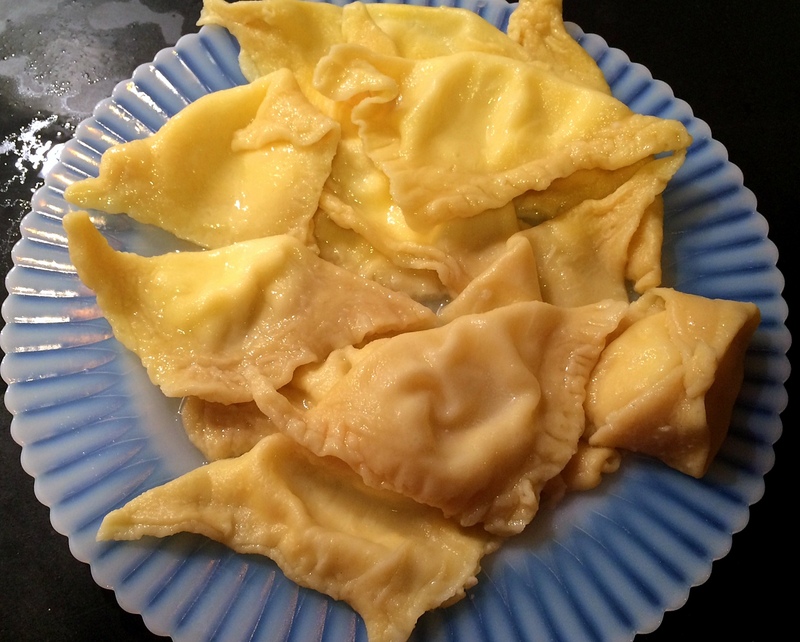 I was asked to use a dairy filling, though the meat filling is more popular, as kreplach are often served in chicken soup. 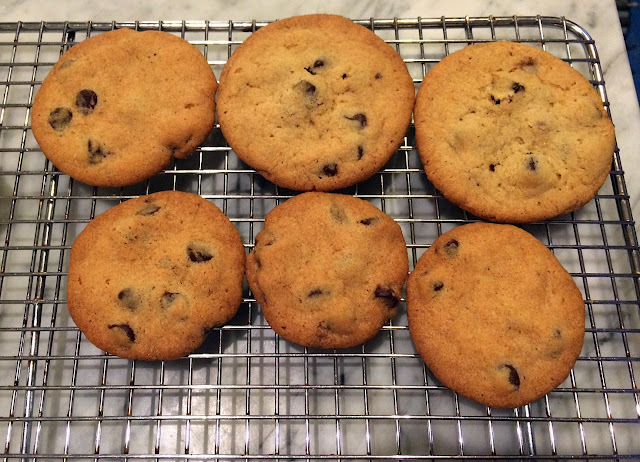 They're not hard to make (but it did take me two attempts to get the dough right) and though the DH said they "look terrible," I thought they tasted pretty good. 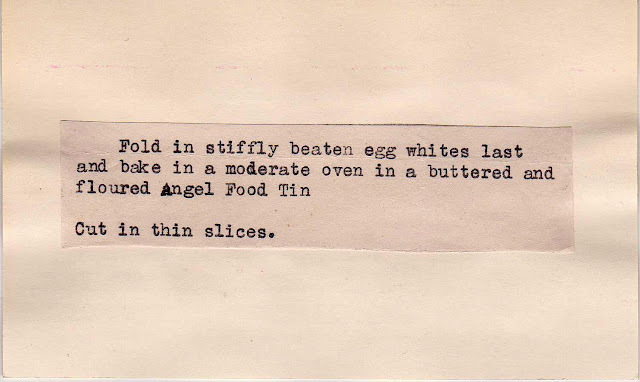 I began with a recipe given to me by my friend Hanna (who works at Eldridge Street, and extended the demo invitation). It's from her mother's "bible," the Avodath Sharon [Massachusetts] cookbook. I had only moderate success with the dough -- but the cheese filling recipe is divine and very easy. To perfect the dough, I combined Hanna's recipe with one I found in Arthur Schwarz's Jewish Home Cooking, my bible for Ashkenazi recipes. The recipe is at the end -- but if you're in town, do stop by the festival to witness the demo! 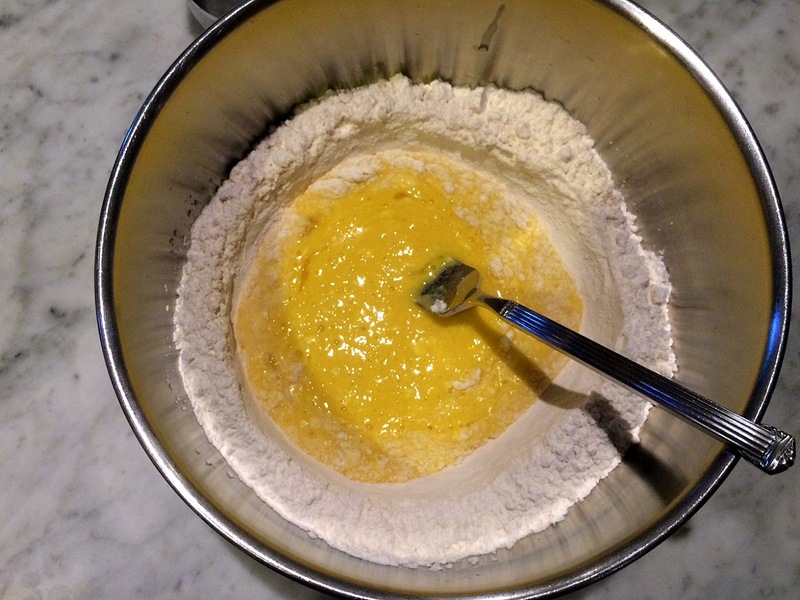 Begin by making a well in the flour. Add two eggs and some water. 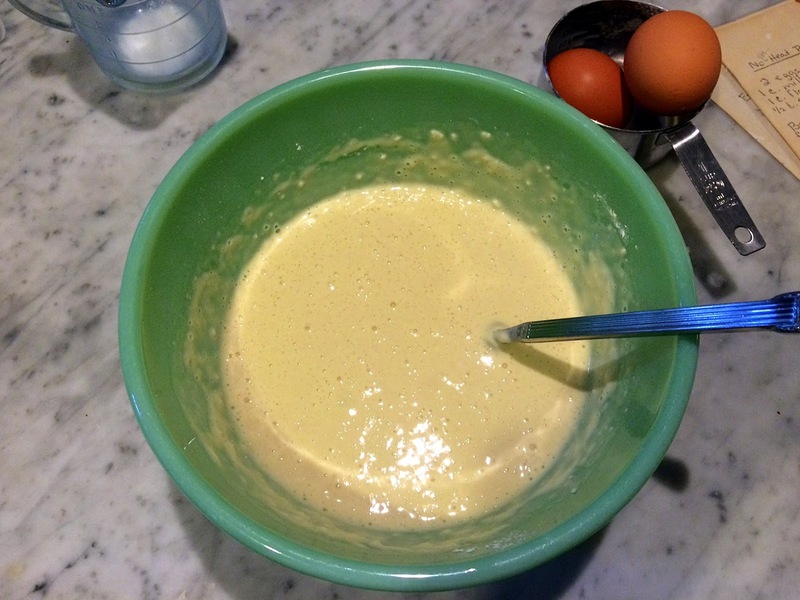 Beat the eggs and water together, and slowing begin incorporating the flour in to the the liquid. And then get shaggy like this, at which point it's time to use your hands to blend it all together. 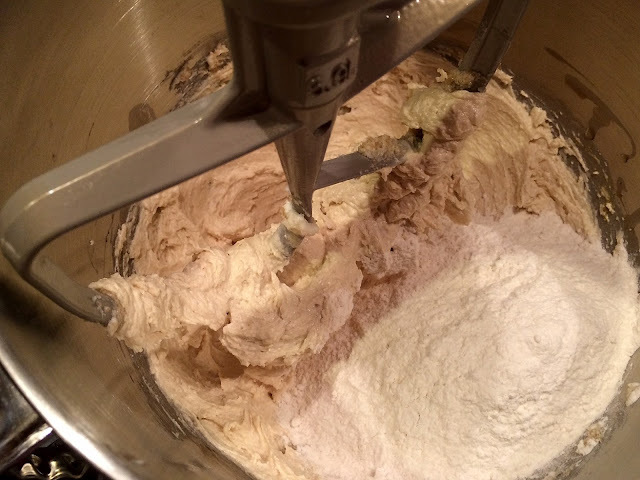 Turn it out onto a floured surface and knead until it's smooth and elastic. Let the dough sit covered for about 30 minutes to relax the gluten. Then begin to roll it out. And keep rolling until it gets very, very thin. Cut into 3-inch squares, using a knife or a metal bench scraper (which worked much better). 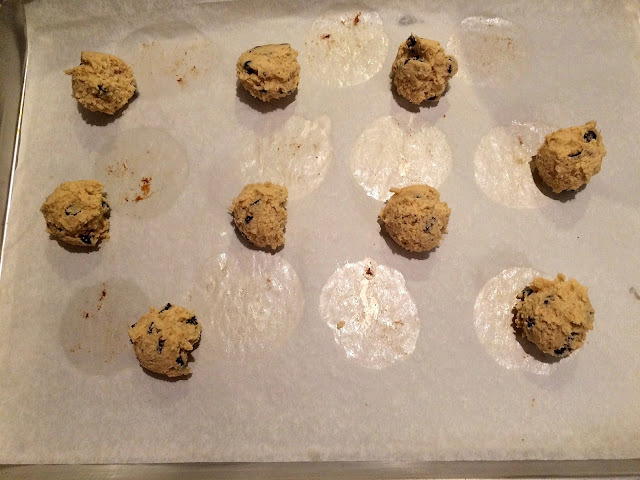 Put a small amount -- a teaspoon or less -- of filling in the center of each square. Using your fingertip, wet the edges with water, and fold the dough from point to point to create a triangle. 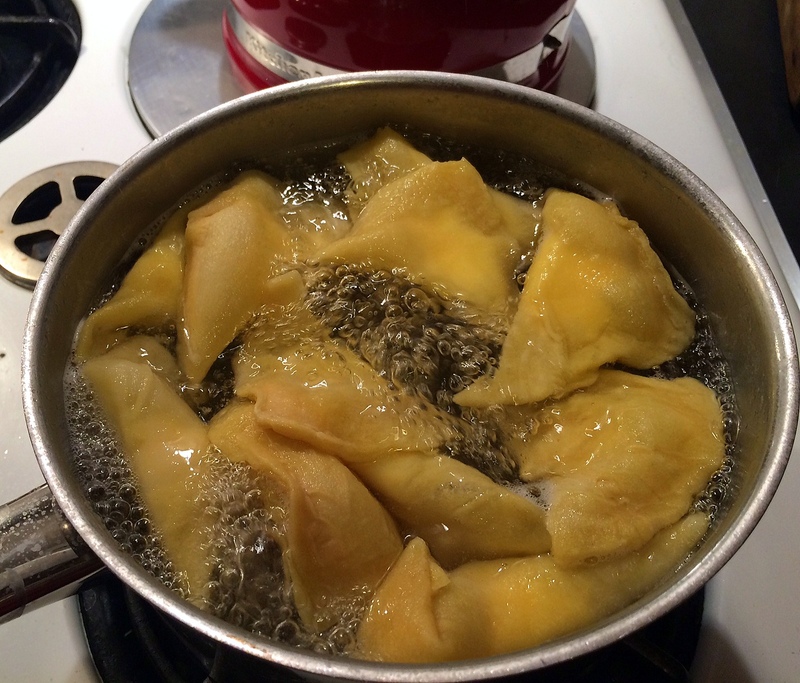 Let the dumplings sit for about ten minutes, while you get a pot of water to come to the boil. Add a very liberal amount of salt to the water, let it reach a boil again and carefully add the kreplach to the pot. 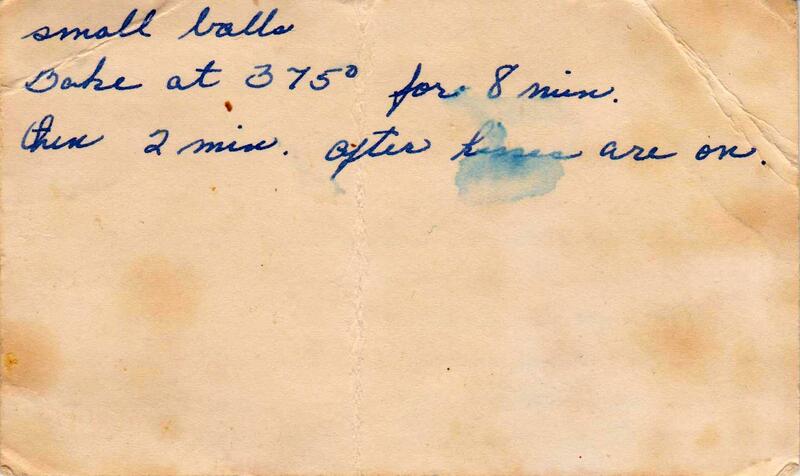 Boil for 10 to 15 minutes. 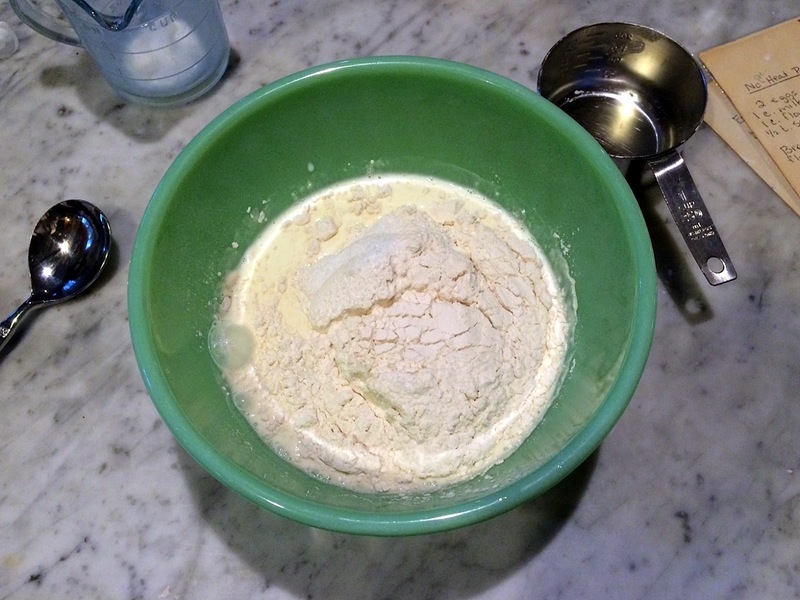 Put flour in a large bowl and make a well. 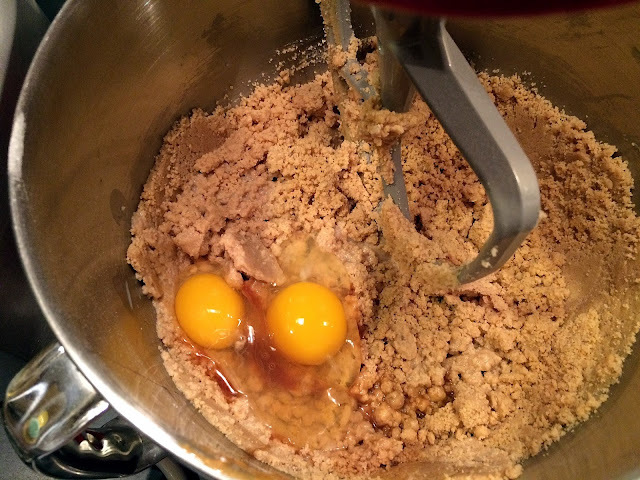 Break two eggs in the center, and add the water. The actual amount of water needed will vary slightly, depending on the humidity, etc. 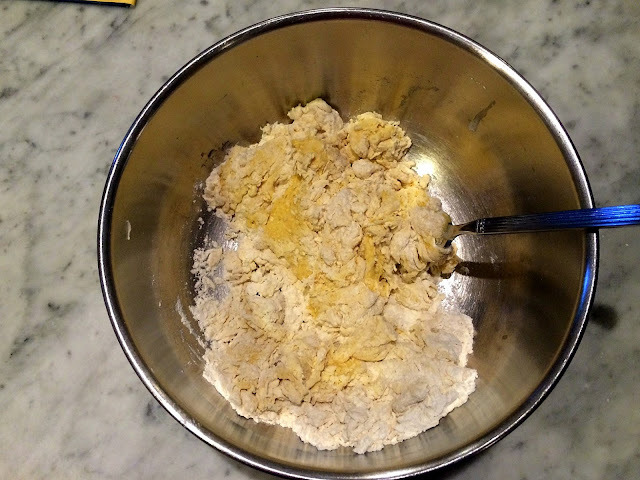 With a fork, blend the liquid portion together and then slowly being incorporating the flour until the dough gets shaggy. Use your hands to finish the job. Then knead the dough on a floured surface until it is smooth and elastic. Cover with plastic wrap and let the dough rest for 30 minutes, while you make the filling. Divide the dough in half. 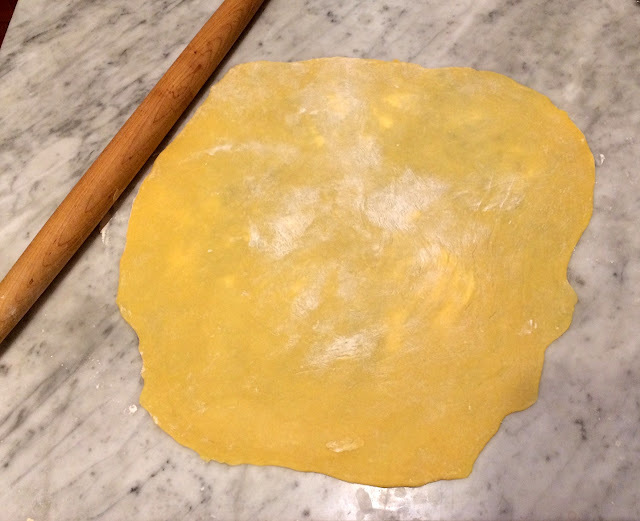 Working with one half (while the other remains covered), roll out on a floured surface until very thin. Cut into 3 inch squares. 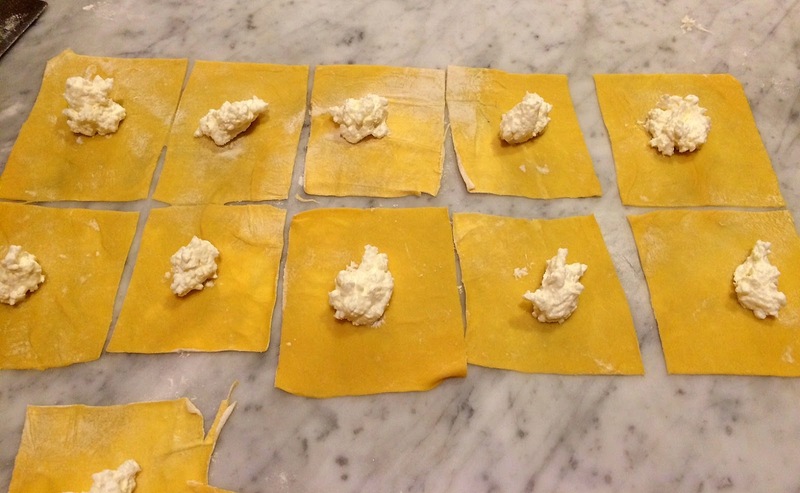 Working quickly, place a scant teaspoon of filling in the center of each square. With your fingertip. wet the edges of each square and fold over, to make a triangle. Seal the edges very well. Let dumplings sit for ten minutes before boiling in salted water for about 10 to 15 minutes.